Two talented First Nations leaders have joined the New Pathways to Gold Society (NPTGS) Board of Directors. Mike Retasket (left) and James Hobart attended their first meeting as directors in Ashcroft on Oct. 19. Retasket is the new Director representing Tourism Associations while Hobart is the First Nations Director representing the Canyon region of the Hope to Barkerville corridor. 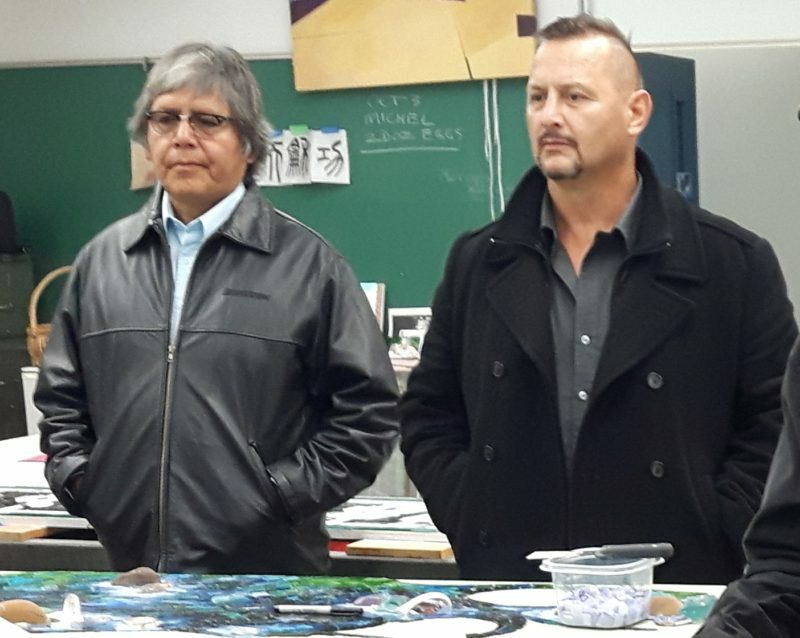 Both directors have held the position of Chief Councillor of their First Nation. Retasket served for 10 years as Chief of the Bonaparte Indian Band. Hobart was Chief of the Spuzzum First Nation for four years. Retasket is a champion for traditional knowledge and cultural-heritage values. He’s a storyteller, traditional pipe carrier, dancer, drummer and singer. He’s also an experienced negotiator who has developed MOU’s, protocols agreements and land and resource management plans. A founding member of B.C. First Nations Leadership Council, he’s served on several boards including the Fraser Basin Council, First Nations Emergency Service and First Nations Forestry Council. Hobart served two terms as the Chief Councillor for the Spuzzum First Nation and was also their CEO, managing budgets of over $1 million. He co-built the Nation’s first tax board, Negotiations Committee and land use management plan. He was appointed by his peers to the Chair of the Aboriginal Children and Family Chief’s Coalition and by the Union of B.C. Indian Chiefs as the Political Liaison to Comprehensive Claims Canada. He’s also an inventor who has successfully built prototypes and submitted three inventions into the ISC nationwide data base. Retasket and Hobart are no strangers to NPTGS. Both have worked with the Society on various projects in other capacities over the years. “Having worked with James on the Alexandra Bridge Project and Mike with all the work he’s done with Klahowya Village and elsewhere, it feels like a very good, familiar fit,” said NPTGS Co-chair Terry Raymond. The NPTGS board is balanced, with half of the Directors being First Nations representatives. There is also one designated Multicultural Director and two co-chairs, one of whom is First Nations. A non-profit organization, NPTGS is committed to developing local economies in the Hope to Barkerville corridor through heritage tourism development, First Nations reconciliation and Multiculturalism. The Society acknowledges the financial support of the B.C. government.